My experiences with the Shriver Center were my most meaningful at UMBC, and they showed me how to incorporate social change into my future ambitions. I appreciate how UMBC encourages and empowers students to create change on and off campus. Jaelyn Bos has long been committed to leadership through service, and throughout her time at UMBC she has sought out experiences to grow her ability to impact local and global issues, from her time in the Shriver Living Learning Community to her study abroad experience in Ecuador. Bos served as the community outreach coordinator for Arbutus Achievers, a group that supports students at Arbutus Middle School who are striving to move past challenges. She won a BreakingGround grant to organize Service Fest, an on-campus event that brought together local non-profits with potential student volunteers. She also created the “One UMBC, One Baltimore” interactive online map to share information about Shriver Center outreach activities. By her senior year, Bos was named France-Merrick Fellow for her “exemplary commitment to service, leadership, and civic engagement on the UMBC campus and in Baltimore City. 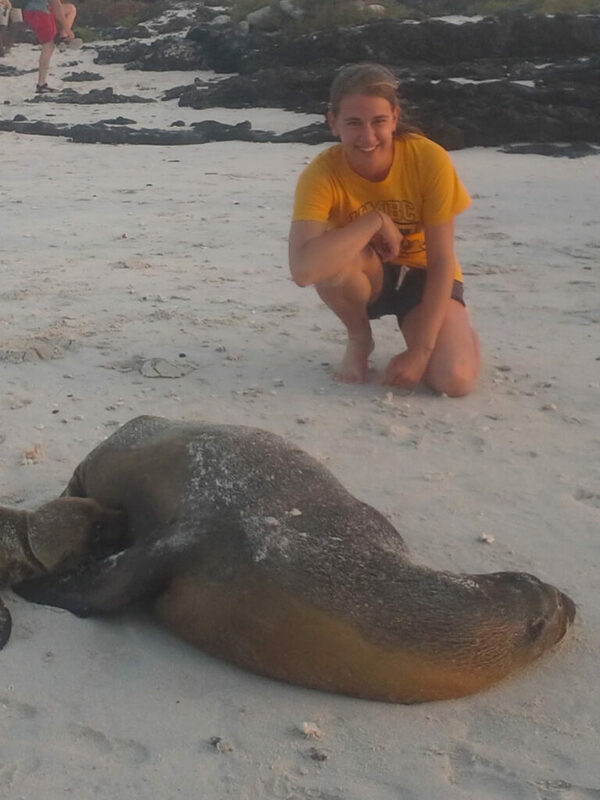 Jaelyn Bos with a Galápagos sea lion during her study abroad experience; photo courtesy Bos. Bos bridges her commitment to social justice with a passion for ecology, undertaking internships at the National Park Service and Cary Institute of Ecosystem Studies, and holding a research assistant position with Matthew Baker, professor of geography and environmental systems. It is this combined interest in community engagement, ecology, and passion for learning that has inspired Bos’s next step after graduation: teaching biology to secondary school students in Mozambique as a Peace Corps fellow.